The above title is borrowed from a tweet from author, Eric Metaxas, yesterday in light of Houston Mayor, Annise Parker, having 5 area pastors’ sermons subpoenaed. The national response has been, as you would expect, explosive. I agree with Metaxas. Strongly. 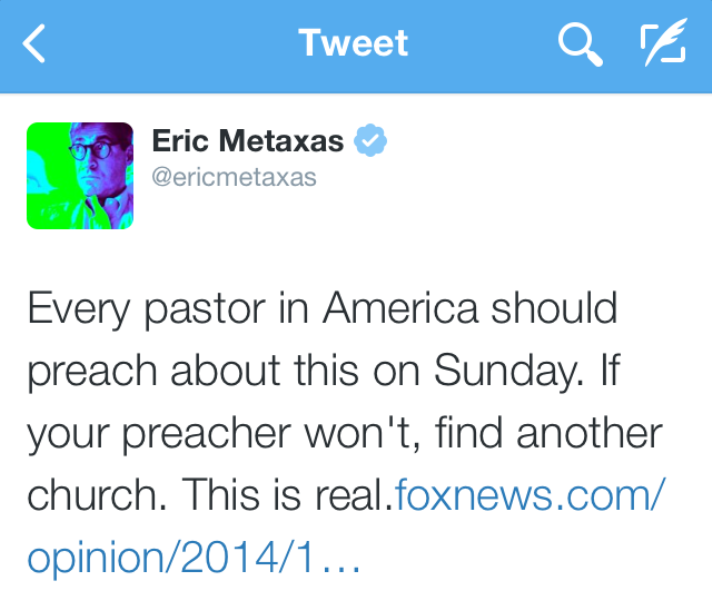 (If I was pastoring a church I wouldn’t need Metaxas’ tweet to help me decide what my sermon topic would be for this Sunday.) Randy White agrees . Before Metaxas’ tweeted his outrage, White, pastor FBC, Katy (Houston suburb), posted his own passionate response to Mayor Parker. You can read his righteously indignant response here. A friend rightly commented, “You are on target but it also is about homosexuality.” I should have been more clear in my initial Facebook post. I responded to my friend: I agree – this is also about homosexuality. But, homosexuality is merely the contemporary issue at hand to serve satan’s overriding goal: the strangulation and, ultimately, removal of religious freedom. The error would be making this solely about homosexuality – the objective here is far more sinister – the systematic eradication of religious freedom. Am I overreaching here? I don’t think so. But, that’s my opinion. And I am not alone. (Although I wouldn’t care if I was.) In fact, it appears that Mayor Parker has awakened a sleeping giant. You can read National Review writer, David French’s, strong editorial here. Mayor Parker, as a city official, should know better our constitutional rights. She is attempting to do to pastors what she would never tolerate having done to her. There are those who are saying, “Mayor Parker isn’t trying to suppress religious freedom. She simply wants to make certain pastors aren’t using their pulpits for politics.” Sorry. Nice try. The mayor’s actions reach far deeper than that, and those who hold to this view know it. The blogosphere and news sites are replete with articles about this topic. You can read up on the details behind this controversy by clicking on any of the highlighted links in this blog. The best response I’ve read thus far is this one – it’s one that appears (to me) to serve as a perfect example of “speaking the truth in love”. I’m praying Mayor Parker sees it and takes it to heart: An Open Letter to Mayor Annise Parker.